MINI has revealed the all-new Countryman crossover, which is priced from £22,465. It’s larger and more spacious than before, plus it comes with a higher level of standard equipment including navigation. First deliveries are due in February 2017. The entry-level variant is the Cooper, which is powered by a 1.5-litre petrol engine producing 136PS. 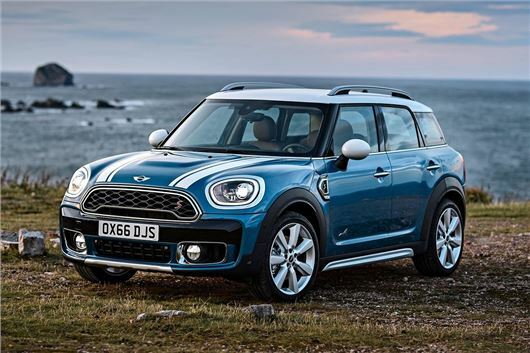 There is also a more powerful petrol option in the form of the 2.0-litre 192PS Cooper S, while the diesel range consists of the 150PS Cooper D and the 190PS Cooper SD, both 2.0-litre. All four engines are available with front- or all-wheel drive and the choice of a manual or automatic transmission, excepting the Cooper SD which is an automatic only. For the first time there will also be a plug-in hybrid variant, powered by a 1.5-litre petrol engine linked to an electric motor and battery pack. Total output is 224PS, with 385Nm of torque, yet emissions are 49g/km and official economy is 134.5mpg. Called the Cooper S E All4, it can cover short commuting distances on electric power alone and takes three-and-a-quarter hours to charge from a standard wall socket. Inside, the new MINI Countryman is more spacious than the outgoing car. The rear doors are larger for better access, while the rear seats can be adjusted to maximise legroom or boot capacity depending on the situation. Luggage capacity is a decent 450 litres, which is more than the 410 litres in the similarly priced Audi Q2. Standard equipment across all models includes parking sensors, Bluetooth and navigation, but there are plenty of options too. These include a larger screen, improved audio system and numerous option packs. The Chili Pack is specified on most MINI models and includes climate control, sports seats and LED headlights. Other optional extras include a fold-out picnic bench, a touch-free boot opening system and a wide range of wheel designs, paint colours and interior detail finishes.